UCL Urban Laboratory is delighted to announce that UCL has received an award from the Leverhulme Trust to fund Tom Wolseley as artist-in-residence to work with Urban Lab Co-Director Dr Andrew Harris during the academic year 2015/16. The residency - titled 'Shardology: New Visions of Vertical London' - will research the Shard, London and Western Europe's tallest building, as an object and event between the financial processes that funded it and the imaginaries of the people who experience it in their city. Tom will create an essay film as a way to examine the Shard from a range of perspectives; emotional, economic, social, architectural, cultural, international, political and geographical, in a meandering narrative, that also references the construction of the film itself. The broader research will be archived on an interactive website. He has worked for over 20 years, creating films and installations that explore our relationship to the environment we live in, with increasing emphasis on film and the city. He has collaborated with a diverse range of practitioners to develop a practice/methodology that reflects on its own condition as it does on the subject. He has created and worked within his own semi fictional institution, Architrope, previously based in an up-cycled shipping container in an urban park in Hackney, for 5 years. Tom is interested in the relationship between individuals and a city increasingly dominated by spectacular global narratives. He will be developing conversations across UCL's areas of expertise to engage and think about how we can use the Shard as a tool to understand the changing relationships between capital, the urban and ourselves. Tom would like to encourage anyone that is interested in participating in conversations about the Shard to get in touch with him (tom@architrope.com). Previous projects by Tom can be seen at architrope.com, and on his Vimeo channel. 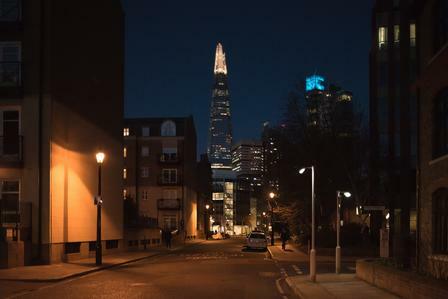 Image: The Shard pictured from surrounding streets at night, by Tom Wolseley.